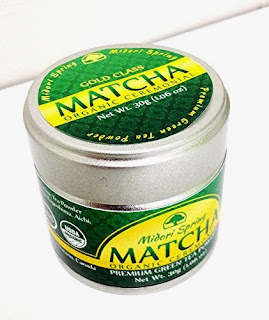 Homemaker Highlights: Midori Spring Ceremonial (GOLD) Matcha Green Tea Review. Midori Spring Ceremonial (GOLD) Matcha Green Tea Review. This is a ceremonial grade premium green tea. This tea is used more so for brewing, than a cooking powder, but you can cook with it if needed. Since the tea quality is so high and full of flavor, it is mostly reserved for tea ceremonies and it's health benefits. I am an avid tea lover and this was my first time trying this particular brand, even style of tea. It did have a rich and even creamy flavor, but it also had a bit of sweetness to it. Beautiful green color and it does have a green vegetable type of aroma to it. I loved that it was organic and Kosher friendly. This company only selects the best raw materials from their tea gardens in Japan. While I did not brew my tea in the ceremonial way, I did adapt my own way of brewing to my own taste. The whole point is to just enjoy your tea and take in it's super food benefits. Benefits include increased energy, reduces stress, improves mental alertness, helps with weight loss, and so much more. Labels: Midori Spring Ceremonial (GOLD) Matcha Green Tea Review.